How many girls have dreamed of dancing with Bingley at the Netherfield Ball or of having their ‘fine eyes’ admired by a stony-faced Mr Darcy? In the year that marks 200 years since that scene was first admired, lovers of Jane Austen can relive the moment for themselves at Brocket Hall, where the BBC filmed its 1995 version of Pride and Prejudice in the magnificently decorated ballroom. It is now a dining room, but the painted, gilded ceiling is as gorgeous as ever, and the wooden floor simply invites one to waltz around it. Indeed, it was in this very room that Lady Caroline Lamb introduced the dance, considered shockingly risqué at the time, to England in the early 19th century. 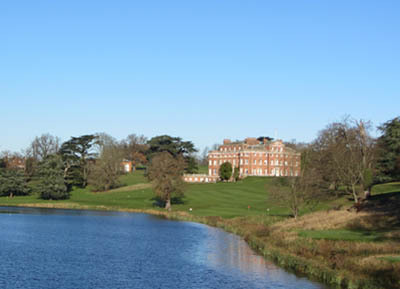 Brocket Hall has a long and chequered history, with owners including the 1st Viscount Melbourne, who entertained the Prince Regent, and Prime Minister Lord Palmerston. Viscount Melbourne, Queen Victoria’s first Prime Minister, often welcomed the Queen to the hall, and the room she always requested still bears her name. In more recent times, the building’s fame briefly gave way to infamy with the jailing of the present Lord Brocket for insurance fraud, but no trace of such a blip can be found in its current state. Set in 543 acres close to the A1 with Hatfield not far away, the James Paine-designed house is approached via a winding drive that winds through the Capability Brown-esque grounds and over a fine stone bridge. The hall is warm and welcoming, with sweeping stairs leading up and doors leading to the morning (now breakfast) room and drawing room With family portraits on the walls and black-and-white photographs of children in prams and hunting days adorning the surfaces, one feels as if one is a guest in a house where the hosts have simply popped out for a moment. Instead, we were welcomed (eventually) by a butler, who ensured we wanted for nothing, from tea by the fire to G&Ts before dinner. A quick poke around upstairs revealed beautifully decorated rooms, extravagantly warm on a freezing day, with comfortable beds and luxurious bathrooms in a variety of styles-including a particularly striking haven decorated with trompe l’oeil in a vaguely Tuscan style. Top billing goes to the room that once belonged to the lady of the house, with its charming green shades and glorious views over the lake, and the Prince Regent’s Room with its spectacular Chinoiserie wallpaper and vast bathroom. However, there was no time to collapse on a sofa, as we were booked in for a golf lesson at the Palmerston Golf Academy, which features two championship golf courses and several practice areas, including a Swing Studio where cameras capture every foible of your swing-slightly nerve-wracking at first, but certainly effective. Neither my friend nor I had ever wielded a golf club in anger, yet, after an hour or so with Simon Garner, we could be fairly sure of sending the tiny white ball a decent distance. Practice was enlivened by several brave-or stupid-pheasants wandering around the driving range, but, sadly, our aim wasn’t quite good enough to provide the kitchens with fresh meat. In any event, there would have been no call for such an offering, as the Michelin-starred Auberge du Lac restaurant, set in the old hunting lodge over the lake from the main house, needs no help in whipping up a feast fit for any of Brocket Hall’s historic guests. After Dom Perignon and caviar, we luxuriated in a nine-course tasting menu with paired wines and Krug Champagne. Some courses were a little too clever, such as the apple, beetroot, buttermilk and tarragon concoction frozen with liquid nitrogen that simply melted into a flavoured puddle, but highlights included lobster with crispy wild rice, a melting cauliflower amuse bouche and the tender, rich venison with roast crosnes, blue cheese, quince and chocolate. The accompanying wines were spectacular, my favourites being the Rene Mure Clos St Landelin Grande Cru 2007, Alsace, the sweetness of which perfectly complemented the foie gras, and the Argentinian Cheval des Andes 2007, Mendoza, with the venison and duck. The Krug Rose to finish was superb, but I fear our palette was already sated with the previous riches and not quite up to appreciating it. The hotel car that whisked us back to the hall was extremely welcome, although a frosty walk might actually have done us good. Our beds were extremely comfortable, although my friend could have done without a hoover outside starting up at 7am. Such was our gluttony that we couldn’t do justice to the golf club’s restaurant, Watershyppes, the following day, but a wander round the grounds did us good. The golf course is of very high quality and obviously popular, but we couldn’t help feel that the view would be improved if the manicured greens were replaced by White Park cattle. Such romanticism is more suited to the Jane Austen era, however, and Brocket Hall has a 21st-century eye to the main chance-there’s even a helipad near the front door. With 30 bedrooms, the house can be hired as a whole for large parties, business or pleasure, thus forming a splendid base for grand celebrations. This year, for the first time, it will also be available for individual stays on select weekends. Mr Darcy and his party may have left, but there are many reasons to be tempted to the sumptuous surroundings of Brocket Hall. Brocket Hall in Hertfordshire (www.brocket-hall.co.uk) will be open to the public for select events and overnight stays in 2013, such as the Valentines Package on February 15. The Valentines Package costs from £425 per couple, including a champagne reception, four-course dinner in the ballroom with wine pairing, overnight accommodation and breakfast, based on two adults sharing. For reservations, telephone 01707 335 241 or email events@brocket-hall.co.uk.